HTTPS has stopped working for no apparent reason. This appears to affect all forum users, using all web browsers. Our forum has the premium package (due for renewal in 1 month). Won't let me expend my credits. It should've automatically done this without me doing this manually cause I already had the credits. Topic: Won't let me expend my credits. Hey! I was wondering if there was a way to add to an established code (this one) to add status images from @skouliki (these)? I don't understand why the code stopped working all of a sudden but I haven't messed with it as of late but now, it isn't working like it should be. Dice in quick replies not working. When the problem appeared : just a few minutes earlier. Topic: Dice in quick replies not working. 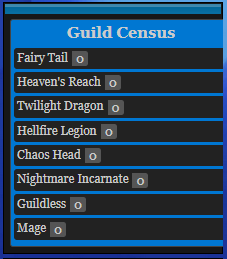 I'm trying to get the code for the member/guild census that @Ange Tuteur. helped me with a while back on my previous account. Yes, I know it says banned but that isn't actually the case. I had asked @SLGray to ban that one since I made this one after losing my login info for the other one. Anyways, I have the code put in the way it should be. I can't figure out why it isn't working. If anyone knows how to fix this, that'd be great. I'm presuming that this is a coding problem? Around the end of January, the table I use (copied and pasted from a Microsoft Excel Spreadsheet), started to "slip" down the page after being sent. Some, including myself, edited by backspacing to the top and resending. Can anyone help me to rectify this please. When the problem appeared : This problem was caused when I went to purchase a package with my credits that I had bought, yet it redirected me to my Paypal account. To begin I find your forums very easy to use and I've used your forums before a few years ago. I've bought credits using my Paypal and thought that I would be able to purchase a package using the credits that I have bought, however that does not seem to be the case. When I went to buy the package using my credits, it basically told me that I had to go through Paypal and subscribe to a monthly subscription which I am not opposed to. I cannot find exactly how I am to use the credits on my forum considering I cannot use them to purchase the package I wanted nor can I use them when I am attempting to purchase no-ads and other add-ons to my forum. They seem to be basically useless unless I am to purchase a custom domain, which I had planned to do when I would purchase the premium membership with my credits. Are my credits basically useless and I am now required to pay the $9.60 reoccurring fee for my forum to be premium? Is there any way I can get a refund for this so that I can purchase the credits that I need to get a custom domain and use the other funds to subscribe to the monthly subscription? You can contact me through email or messages. Looked around and I found very few options for #Invision Boards and only one that worked for me... Night Mode. I just added the "Latest Topics" widget and it's showing up double on my board. It's scrolling up inside and doing so outside of the widget. What can I do to stop this from happening? As you may have seen, I have a lot of news posts on the site, but the thing I have not been able to do is post videos to go with those articles or those videos that come with Twitter posts. Can someone tell me how can I add these videos to my news posts? How can I change my Forumotion forum address? In the past, I have used a personalized domain name for my forum. 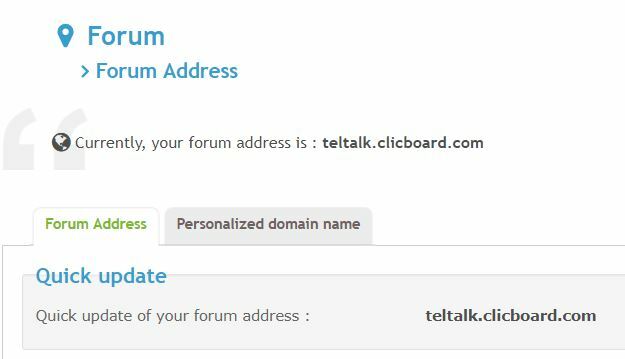 Since today, all forum guests get redirected to the Forumotion forum address teltalk.clicboard.com. That's not nice without any announcement. So I have investigated that I need to buy a forum package for this service, now. Since the Forumotion forum address is old, I would like to change it instead. In the past, I could adjust it easily. But as I see, this isn't possible anymore, either. How can I adjust my Forumotion forum address to a nice one, now? Topic: How can I change my Forumotion forum address? I was wondering if there is something I can do to change the order of my subforums? As I and other members prepare to post, we notice that there's the main forum with the subforum below it. Also, is there a way to change where I have the mini profile (changing it from the right side to either the left or above the post)? Thank you so much. You all have been so patient with this Zetaboards refugee and recently "transient" from IcyBoards/MyBB. Thank you. When the problem appeared : Since I have first constructed the forum. This is a debate/discussion site designed to get people talking! You get a news article and my opinion, and you get to Byte Back Pure and Simple!" from the Header, but keep my logo as it is. [Only Topic] "Host an image" button not working. Please only post in this topic if you are having issues with the host an image button in the text editor. It doesn't work on here either. The message it gives is: "The page isn't directing properly. Firefox has detected that the server is redirecting the request for this address in a way that will never complete. I have "Accept cookies" enabled. Topic: [Only Topic] "Host an image" button not working. Yesterday the entire forum, as well as this one was down for maintenance and it was posted up on the twitter in regards to it. After the maintenance there was a brief period where my forum was rolled back momentarily before being updated again. Now my forum is experience an incredible slow down. (This is resulting in posts getting posted numerous times).  The forum also sporadically goes offline stating it will be back up soon and is under maintenance. It will then come up for a couple minutes, with the incredible slow down and then go back to the maintenance screen posted above. It occurs on PC and Mobile platforms. There were no issues up until yesterdays maintenance. When the problem appeared : Roughly a week ago, a ignored it expecting whatever change was made to be reversed. The BBCode Buttons are taking up the majority of the space used to type, showing as a individual words in a massive line, rather than a tight and graphic-ized bunch at the top of the screen. Using the database for my users to more than just formotion. When the problem appeared : Uhm its not a problem, but a question. I was wondering if there was a way that i could use the same database on my formotion website, to more than just the website. like grapping the users into html so they can use the same account when logging in. Topic: Using the database for my users to more than just formotion. Is it possible and if so how to have new members request permission before joining the forum? Asked to have forum closed long ago, it wasn't now hackers have it. When the problem appeared : When I asked to have the forum closed a long time ago, and it's still open. Per Title I made a forum a long time ago, asked to have it closed it was never closed, and now I believe hackers have it and are using it for bad purposes. Topic: Asked to have forum closed long ago, it wasn't now hackers have it. 1. I manually went to Topic'it, clicked on "+ Add a forum" and entered the url to my forum, i.e. "1. To link your forum to Topic'it app, connect to your Topic'it account by clicking here"
on the page above and came to the same page in Topic'it as I found manually before. This time however I got a DB error instead of an API key. I have tried a few more times but with the same result. Yooo My Forum Chaptcha is not showing! no member can register anymore on the forum! I looked into this matter in the help board but couldn't seem to find code for invision forums. 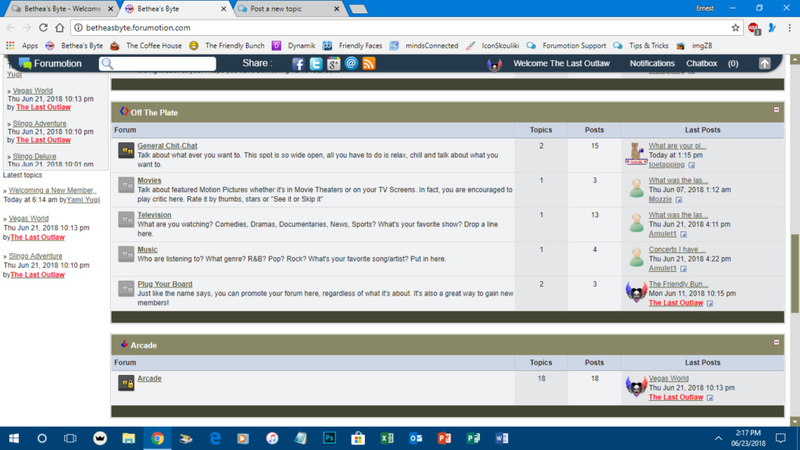 So we have widgets on the both sides of the actual forum, and would like to hide them outside the home page. ABOVE PROBLEM IS MY MAIN CONCERN but I'd love to have the following problems solved as well. I also have problems with hiding the forum name in the navigational category chain (would love to hide it on the homepage as well). 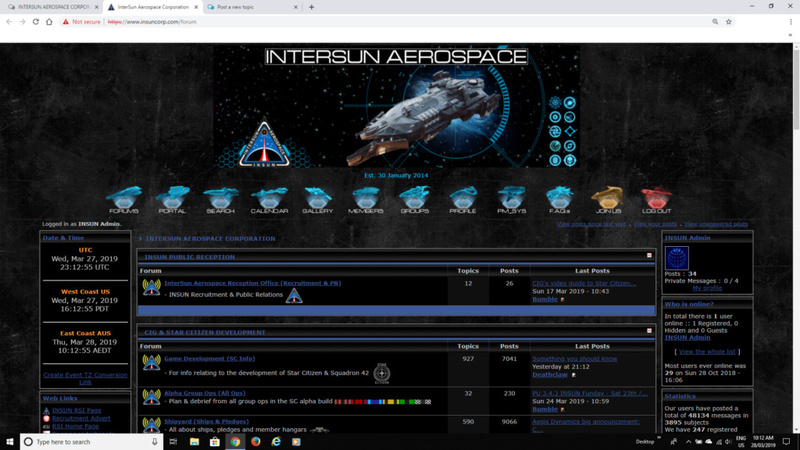 Then I haven't yet successfully implemented code that would reduce the spacing between different categories thus making the forum feel more "whole". When the problem appeared : This is on-going. I have no idea of whether this is possible or not? Is there a way to change only the background in a forum, without necessarily changing the whole theme? Topic: Changing/Modifying Only the background. Every theme, what have been posted in my game, will deleted first posted theme in forum. I have there just two pages with themes and every time, I or anyone else post some, it vil just deleted last theme in forum. I dont know what should I do with it. Can you help me? Pokaždé když pošlu nové téma, smaže se úplně nejstarší téma, které je ve fóru založené. Mohu tím pádem mít jenom dvě stránky témat, přičemž se budou pořád mazat, potřebuji aby zůstala témata zachovalá. Hledala jsem v nastavení, ale jednoduše to najít nemohu a nevím o nikom, kdo by mi s tím mohl pomoci. Všem uživatelům fóra jsem dala vědět, aby nic nepřidávali - mažou tím práci ostatních.. The forum I am setting up is for members only. I have set the user activation to Admin (so that I can approve all registration requests). The activation process is not working as per the description of the "admin" level. Basically any registration request is automatically being activated. I do receive an email stating there has been a request submitted, but when I click on the link to activate the user I get a message from the forum stating "no such user exists" (note: I got the same error when I activated my account to join the support forum). Regardless of the email link not working, the user is always being activated.